Our corporate client department serves as a trusted advisor to many large multi-national corporations around the world. Because of our successful growth and large number of client engagements, we are looking for an analyst to support our team! You will be supporting our consulting team on a variety of different areas. These include the development of new products and services, leading-edge research in the areas of Treasury, Risk and Finance and assisting in the sales and business development processes. You will collaborate with our Zanders consultants to deliver the best possible products and services to our clients. These activities will provide you with a broad experience of working in a specialized high quality consulting firm. As an Analyst, your role within the team is to be proactive, have a keen understanding of the goal of the project and offer creative and innovative ideas on various topics. You are interested in corporate treasury and risk management and you are passionate about bringing ideas to life. You are always looking for new ways to learn and like to be continuously challenged. We offer you the opportunity to work alongside our experienced consultants within our Corporate Clients department. You will be working from our head office in Bussum, receive an appropriate salary and full reimbursement of travel expenses. Our team consists of Treasury, Risk and Finance professionals with a strong analytical background in Finance, Business Administration or Economics. We are an ambitious and enthusiastic team with a focus on fun, team spirit and personal development. We are an international specialized consultancy firm advising global organizations within treasury management, risk management and corporate finance. Our clients choose us because of our specialist and trend setting ideas surrounding financial solutions. Our over 150 colleagues work from our offices in The Netherlands, Belgium, United Kingdom, United States and Switzerland. Zanders encourages its employees to share their ideas and to remain at the forefront of innovative services and solutions. We offer the possibility to specialize and develop professionally, taking on personal responsibility for client projects from an early stage. Our culture is transparent and thrives on the open exchange of ideas and knowledge between colleagues. Graduated? Start as a Consultant and join our Zanders Talent Program! 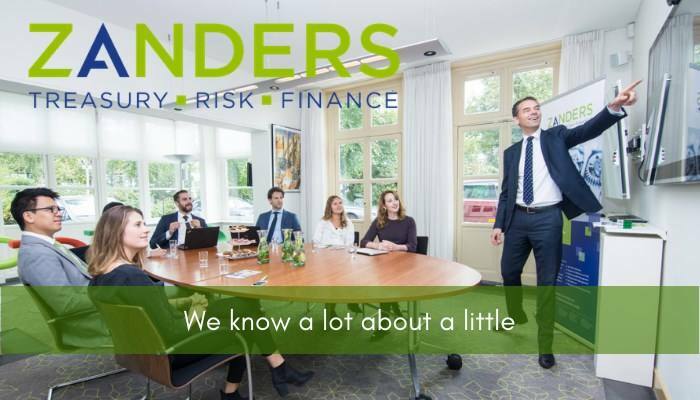 Please send your application for Analyst: Treasury Technology at Zanders in Bussum including your CV via our website.